I made us Eggplant Involtini! Wait, eggplant invol-what in the what? You heard me, my friends. These soft and cheesy pasta-like rolls smothered in garlic bread dip worthy tomato sauce are called Eggplant Involitini. They are my everything right now. But let's back it up. 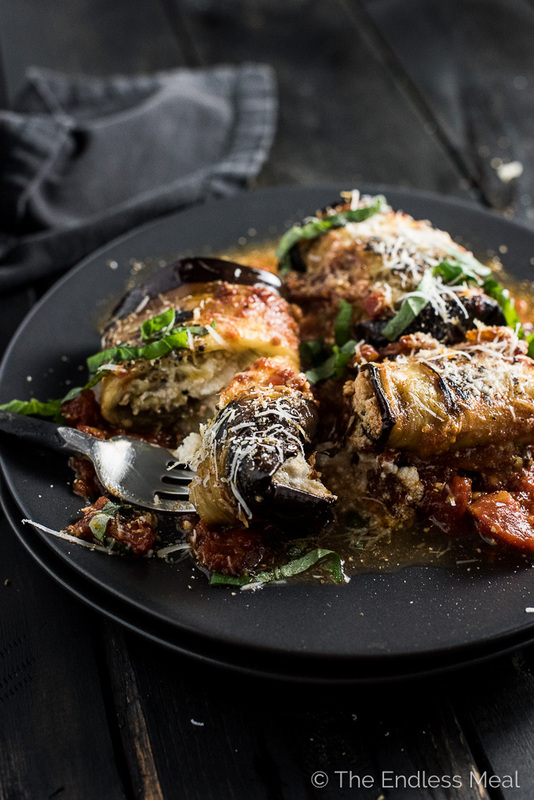 Eggplant Involtini is an Italian dish that is made by wrapping ricotta and parmesan cheeses inside soft cooked eggplant and then baked nestled in a tomato sauce. It reminds me of baked cannelloni, only a gluten-free/ pasta-free version. 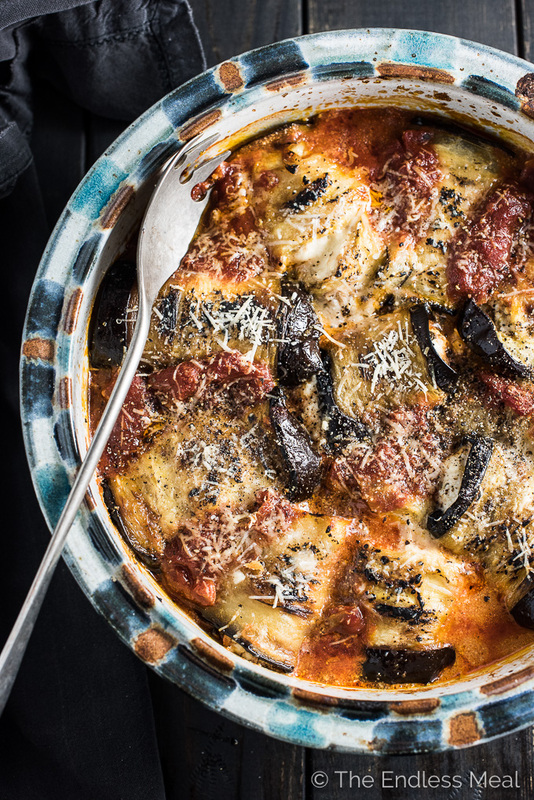 Made the traditional way, eggplant involtini takes ages to make, dirties every pot in your kitchen, and is borderline too greasy even for someone like me who has a big soft spot for greasy food. 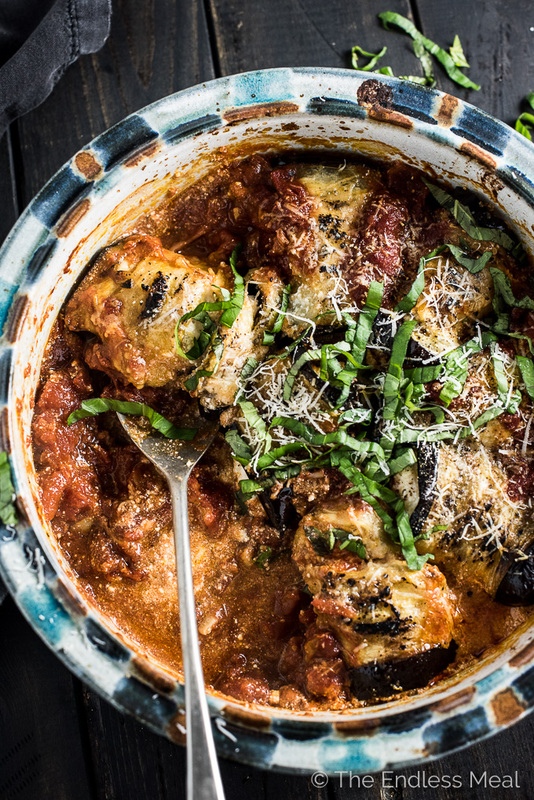 So what the heck is an eggplant involtini recipe doing on a blog that's supposed to be about easy to make and healthy recipes? Well, I gave these babies a makeover. 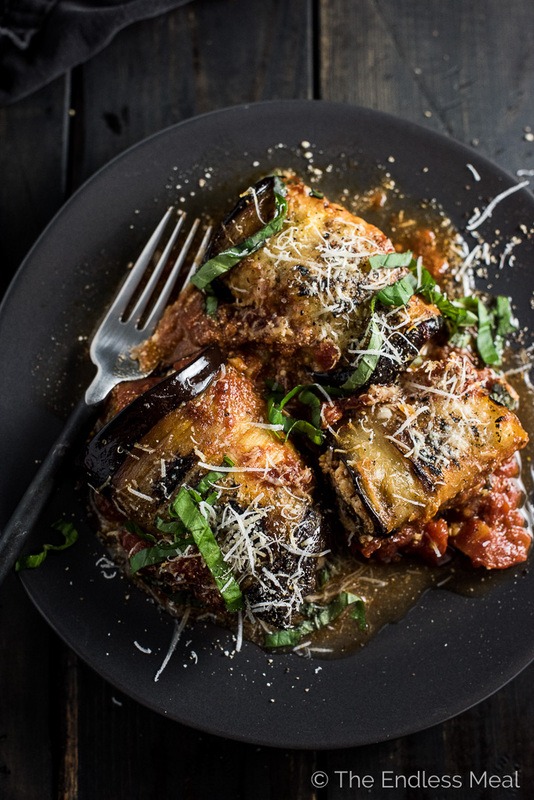 Traditionally, eggplant involtini is made by frying thin strips of eggplant. I've got nothing against the odd crispy, deep fried treat, but have you ever tried to cook eggplant in oil before? It's like a thirsty oil sponge. Honestly, it's kind of disturbing how much oil eggplant can soak up. I did away with the frying step to partly because I'm too lazy to deep fry on your average weekday night. (Mostly cause I'm too lazy.) The added bonus is that the dish is lightened up considerably without all that extra oil. What I've done instead, is baked it with a drizzle of oil. The roasted eggplant strips are soft and pliable, just like the fried ones, but are not greasy at all. ♡ Cut two eggplants into long, thin strips. Bake them in your oven until they are soft. ♡ Mix together some ricotta, parmesan, and a squeeze of lemon. ♡ Simmer a simple tomato sauce. 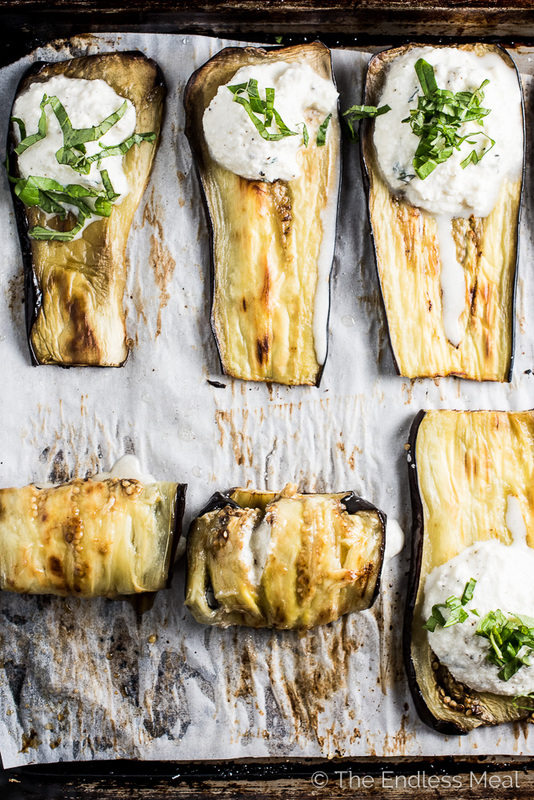 ♡ Roll the lemony ricotta in the eggplant and bake with the sauce poured over top. 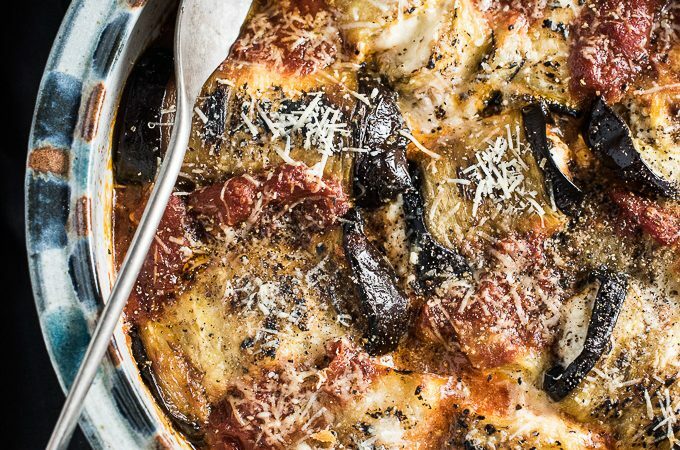 You'll have the ricotta and the tomato sauce made by the time the eggplant strips come out of the oven. 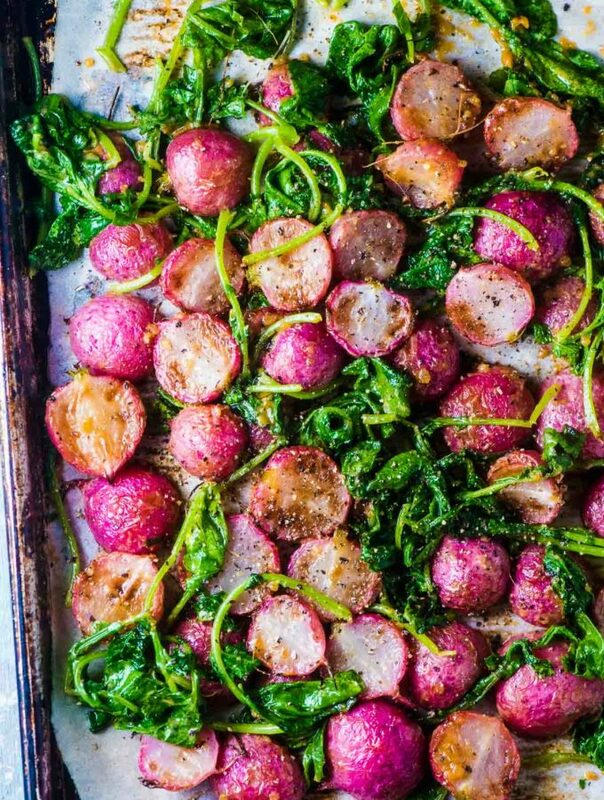 All you'll need to do then is quickly roll them, pop them in the oven, and pour yourself a glass of wine. Pour one for me too and I'll come over to help you eat! 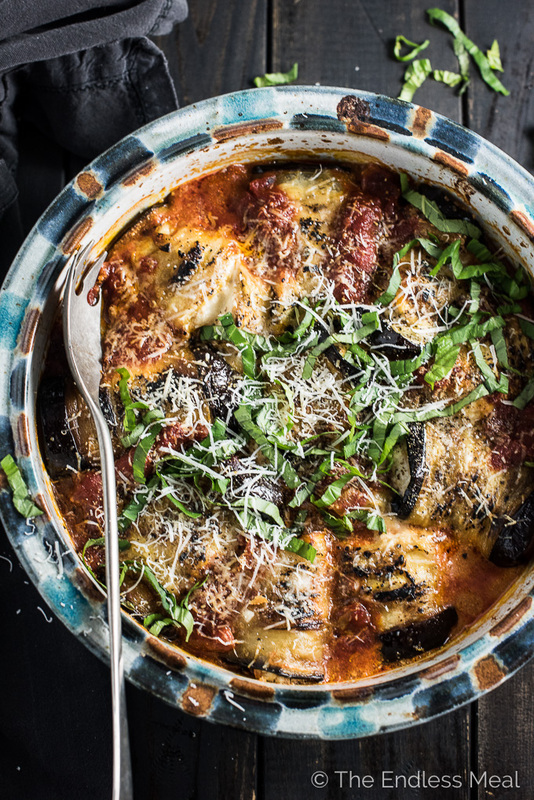 If you make this Easy Eggplant Involtini Recipe make sure you snap a pic and tag #theendlessmeal on Instagram so I can like and comment on your photos. I love seeing TEM recipes you create! Cut the tops and bottoms off the eggplants and thinly slice them lengthwise. 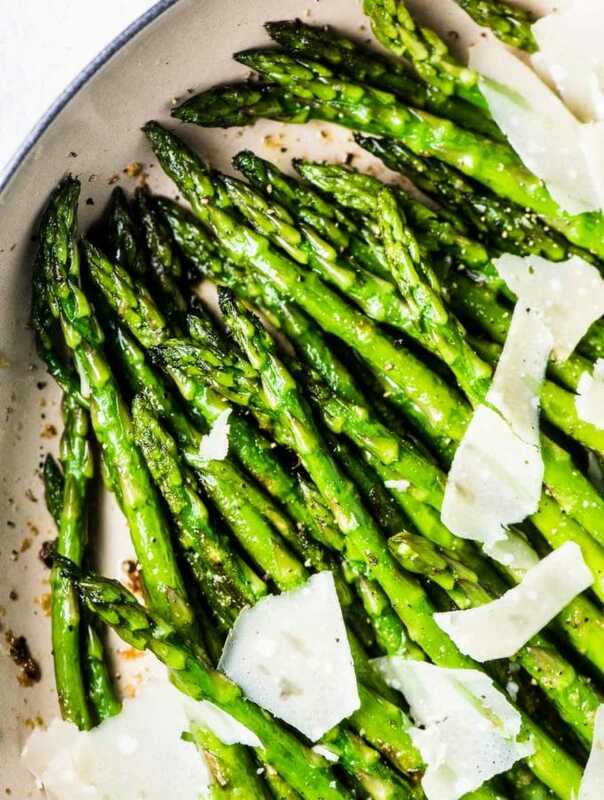 Drizzle them with the olive oil and sprinkle with the sea salt. Bake in the oven for 20 minutes, or until soft. While the eggplants are roasting, prepare the rest of the meal. Heat the 1 tablespoon of olive oil in a medium-sized pot over medium-high heat. Add the garlic and cook until fragrant, about 1 minute. Add all the other tomato sauce ingredients and bring the pot to a boil. Reduce the heat to a gently simmer. In a medium-sized bowl, stir all the ricotta filling ingredients together. When the eggplants come out of the oven, set them aside to cool for a minute. (Keep the oven on.) Pour the tomato sauce into an oven proof baking dish. Divide the ricotta filling between the eggplant slices, heaping the filling on the wide end of the eggplant, and top with the basil. Carefully roll the eggplant around the filling and place, seam-side down, in the tomato sauce in the baking dish. Sprinkle the parmesan over the top and bake in the oven until bubbly, about 15 minutes. Serve with extra parmesan and some basil sprinkled over the top. Can I substitute mars alone cheese rather than ricotta ? I loved this. The flavor was amazing. Such a great meal. I could eat this every day! So delicious. Made it tonight. Since my teenage boys don’t like eggplant I made chicken crepes for them. I thought hubby and I would have a nice eggplant dinner but the boys kept going after the eggplant. Lucky we got to have a couple each. Totally delish!! Great recipe. Hahaha that is awesome! Well, maybe not so awesome that you hardly got any, but awesome that your boys loved the recipe so much! 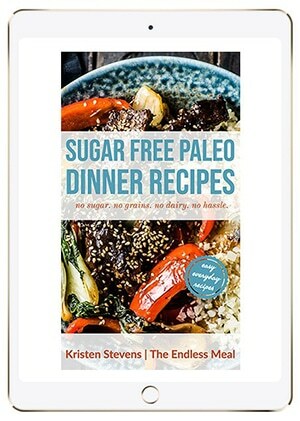 I can’t wait for you to get home so you can make this … you’re going to love it! The eggplant involtini was delicious. I did add a crushed garlic clove and a dash of nutmeg to the ricotta mixture. Very tasty. Looking forward to leftovers. So happy to hear you liked the recipe!! This looks mouth-watering-ly good. All those delicious flavors, yum! I can’t wait to make it, probably before Valentines! I’m so glad you didn’t deep fry the eggplant in all that oil, I can just imagine the amount it would soak up, not very appealing.